Foreclosure Trashouts is a fast, niche business that is viewed as many as one of the BEST Businesses to Start given the current economy. With the flood of foreclosures, high unemployment, massive job losses, many successful entreprenuers are turning to become their own boss’s and start up their own foreclosure trashout service. Jobs are plentiful in the foreclosure trash out industry as well. This year alone there is estimated to be nearly 1.4 million homes that will be foreclosed on and everyone of these homes will need to be cleaned out and prepared to later be put on the market for resale. Below we give you some of the pro’s and cons of starting a foreclosure trashout business. 1. There is plenty of trash out jobs and work! Foreclosures are literally in every neighborhood including the high end luxury real estate markets. 3. Very low start up costs compared to most businesses. You can literally start this business up with as little as $500 and build your business up as fast or as slow as you like. 4. You can set your own hours. You can choose to work part-time or fulltime. You can even start your business up while working a current job in your spare time and earn a very good second income. 5. You can receive work from the banks directly or local Real Estate Agents. 6. The Trash Out Business-this is one business that can grow very quickly, there are many successful trash out businesses earning in excess of $50,000 each and every month. 7. You get the opportunity to clean up the community and help improve property values by providing this valuable service. 1. It is hard work, but the pay is very good. 2. You can get dirty, some of these foreclosure homes are quite dirty. As you can see, there are a lot of pros to the trash out business compared to cons. The Real Estate Market has been a roller coaster ride for the last few years. Many Real Estate Agents have been successful buyer’s “selling” agents for transaction, but you always wonder how the listing real estate agent’s get the Reo Listings. It’s not really a secret, but most Reo Listing Agents do not share this information because why would they want you to take a piece of their business. The average Reo Listing agent has 20 to upwards of 200 Reo Listings at any given time! Many of them are simply working Monday through Friday and earning close to $1,000,000 in commissions each year. Below we have provided some links to help you get started in getting Reo Listings. Foreclosures “Bank Owned Homes” are still increasing and there is still a lot of potential foreclosures “REOs” expected to come out this year. 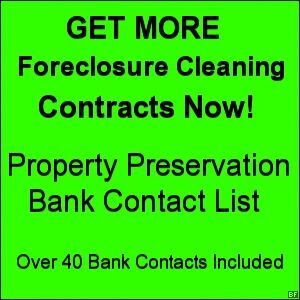 2012 is set to be another record year in foreclosures and many areas are just flooded with these foreclosures, do you want to start getting some of these Reo Listings? 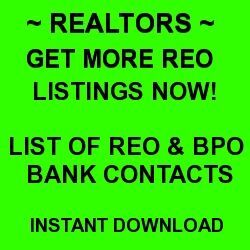 Top 10 Ways to Get REO Listings! 1. Learn the REO Industry and educate yourself how this industry works. Listing Reo Properties is completely different than listing a normal listing as the banks and asset management companies have many different requirements. 2. Invest in your business! Just as you originally did when you started Real Estate, this is one field that you should invest in your business to be successful! 3. Create a Business Plan and a complete plan of action for your new business-and take action now! 4. Register with all the banks and asset management companies!! This can take quite some time, however you only register once with most of these sites. Here is a good Reo Asset Managers Contact list we found very helpful. 5. Make sure you include a picture photo of yourself! This may sound unimportant; however asset managers love to associate a name with a photo. Plus it helps them remember your name! This will bring many more listings! 6. When signing up with all the banks and asset management companies, be prepared to have your signed W-9 form, a copy of your Real Estate License, a Copy of your Errors & Omission Insurance, and your Broker’s tax identification number (if you are not a broker). The Errors & Omission Insurance Policy should state $1,000,000 limits-Check with your broker, this is your insurance amount you usually pay each year. 7. Zip Codes-When you are registering at the banks and asset management company websites, make sure that you include all zip codes you are willing to work. This is how they assign listings- by the zip code of the property that has foreclosed on. If you are not listed in that zip code, you will not be considered for the listing. 8. Get a List of Property Preservation Companies to have as a resource. When you do receive a listing, you may need to call these vendors to go out and prepare bids for you. The banks usually give you a timeline for the tasks they will assign to you and they score you accordingly. 10. Sometimes the asset management companies will try you out with BPO’s. If you accept a bpo order, make sure you complete it on time. The asset managers love to use agents that complete all their tasks on time. Do not call the asset managers much; most asset managers have an average of 100-300 properties they handle and are very busy, majority of asset managers contact of choice is email. Their is good Reo Agent Training Online Courses available and we highly recommend it, this allows you to learn on your own time and you can learn faster. 2011 has been a very busy time for foreclosures and once again the last two months foreclosures are rising again. 2012 will be another record year for foreclosures. We want all of our Foreclosure members to be as successful as possible. We just negotiated a special New Year’s Discount of 40% off for all of you. This is discount is only good through New Year’s Day. Take advantage of this one time special discount of 40% off the master training programs, this includes all the master foreclosure Reo training programs, bank contact lists, marketing programs, and Lifetime Membership into Instant Home Link. Use Coupon Code: New Year and your discount will automatically be applied. Use Coupon Code: New Year and your discount will automatically be applied. Have a safe and wonderful New Year’s and Let’s Start off 2012 with a Bang!